I can feel the stirring in my heart. The moment of perfection, the opening. This perfection unlike the perfection that I strove for many years ago. That perfection involved the tightly held hands in fists, stray hair securely gelled to my head kind of perfection. The straight A’s. The body perfectly shaved and waxed and primped and readied. The need to constantly raising the bar higher and higher, without realizing it wasn’t possible to achieve at that magnitude as a mere human being with a body full of needs and heart full of desire. This perfection is organic, subtle. 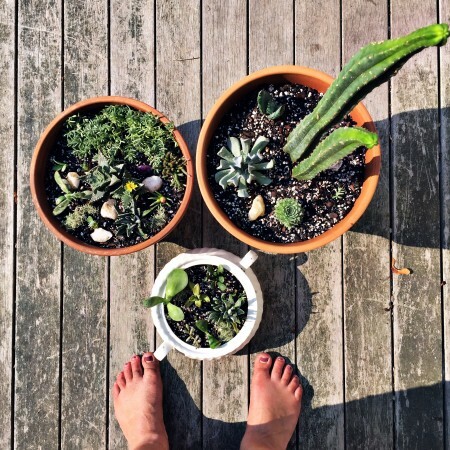 Hands in the dirt, rearranging my sweet garden of succulents when the sun passes down right behind the boat yard behind my house. The smile when I notice, again, that the blue boats on stilts always look like a mountain range when the sun ducks behind them. That pleases me to no end, my own personal mountain range in a land that is decidedly flat. This perfection feels like a private joke between us, me and my life. It is the way that I, find the space between other moments, moments of striving or struggle. It is how I soften into loving my life on the whole. This perfection is about stringing together moments that I am able to truly see myself reflected in – my heart, my dreams, my own peculiarities and predilections. This perfection is highly personal, because each and every one of us blooms in the specificity of what lights us up. Instead of achievements and external validation, this perfection is a collection of moments well loved. I aim to be love drenched. Sweaty and skin warmed from the sun, love drenched is my goal. It is how I want to feel about my partnership, my friendships, my work. I am obsessed with setting up the structures that allow me to love radiantly, deepening into pouring all of myself into what is in front of me without the fear that the love won’t be returned or that I might be thought of as ridiculous. We have to be comfortable being thought of as ridiculous – or too much, or not enough. We have to be fully committed and immersed in what we are building. This doesn’t mean that we don’t care about others or that we become self-obsessed, but it does that we don’t allow our love for our lives to get spoiled by trying to micromanage whether or not other people like us. That is not our responsibility. Our responsibility is to ourselves, first, always. We have to love ourselves. Our ability to love – and accept – our worlds are key to building a life that makes you feel ecstatic about living. The presence of love doesn’t negate adaptation. Acceptance isn’t stagnation. The key here, for me, is to know that I can love my soft, tender spots, adoring the parts of myself that I am also actively working on. I imagine these parts of myself like the worn out elbows or pulled string in a sweater, worn again and again and again. There is no shame here, in wearing thin in places. There is no shame in this vulnerability. I ask myself: what if I treated myself like a precious thing? What if, instead of berating myself for my tenderness, I devoted myself to patching up the places where I am worn thin? The truth is, what I love grows and changes. What I love is steeped in possibility. This is through the constant stretch, the desire to keep showing up and surrendering to what is that creates the fertile ground to plant future seeds in. What I love feels empowered – capable to handle the next task at hand. Collecting these moments of organic perfection between moments of disappointment or overwhelm, reminds me that I there is life outside of this one moment of hurt. It reminds me that I am here, committed to the long view – the life that I am creating over time as I continue to show up. It is a shift in perspective. A deliberate choosing. The decision to prioritize the joy, the moments drenched in love even in the presence of negativity. It is the discipline of pausing from the swift action of my body, moving from errand to errand, to notice the true happiness in my body when I realize that there are four bees frequenting the lavender plant in front of my house or the taste of the absolute perfect ice cream treat on a hot day or the coziness of an impromptu family dinner party in the living room. This is how I show up – how I keep myself present. This is I build a love drenched life, moment by moment.